Bag of individually wrapped extra dark chocolate squares. 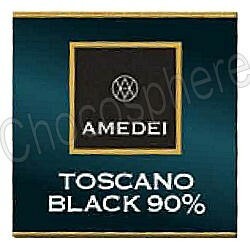 Amedei's Toscano Black 90% extra dark chocolate is very approachable. With a delicate fragrance of white flowers and hot chocolate and flavor notes of toasted bread, Toscano Black 90% invites you to taste a chocolate that is very smooth and creamy considering the high cacao percentage. The finish is long lasting, leaving a very clean palate in the finish. Its distinct taste is persistent and is an invitation to taste further. The 30-square bags of Toscano Black 70% have approximately 135g/4.76oz net wt..